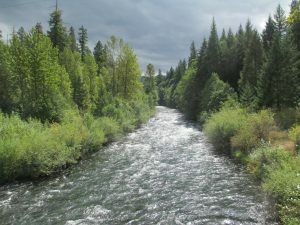 As part of the South Fork McKenzie River Floodplain Enhancement Project, the McKenzie Watershed Council and U.S. Forest Service are temporally diverting the lower mile of the South Fork McKenzie River into a floodplain side channel. The diversion began yesterday, Wednesday 6/27, evening. Contractors will slowly draw flow down in the South Fork over the course of the next 24-36 hours to allow for fish escapement. Fish salvage operations will occur during that time. Project activities, including the diversion, will continue until August 15, 2018. The USACE has reduced flow in the South Fork to 300 cfs during Project implementation. Contractors used a helicopter to fly large wood into the diversion channel and surrounding floodplain on June 25/26. Project managers designed large wood placement to slow flows, which, along with natural vegetation in the channel, will allow suspended sediment to settle out in the floodplain. The diversion channel enters the McKenzie River in a side channel just downstream of the South Fork/McKenzie River confluence. 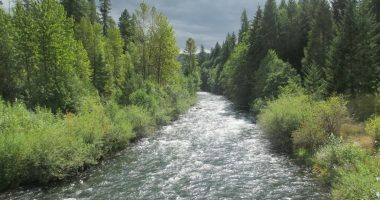 Project managers expect that the diversion may cause short-term turbidity pluses to the McKenzie River immediately downstream of the South Fork McKenzie River confluence.